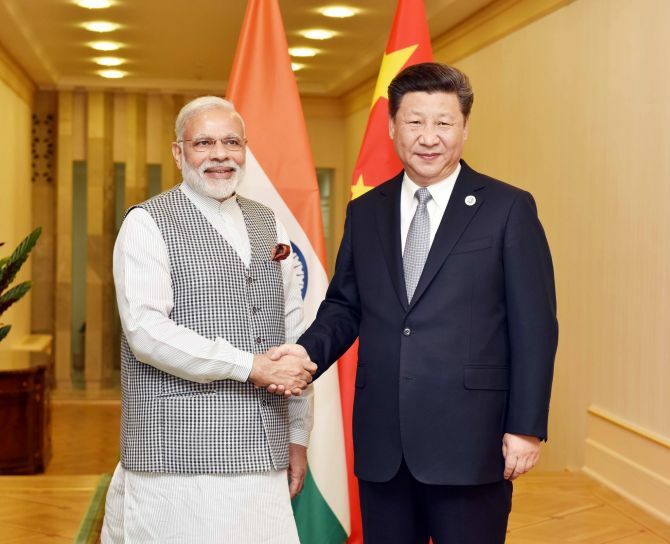 Prime Minister Narendra Modi and Chinese President Xi Jinping have agreed that the Chinese defence minister will visit India next month as part of the efforts to maintain the "momentum" generated by their recent meetings. Modi, who is in Johannesburg to attend the BRICS Summit, met Xi for the third time in nearly three months last evening after their two-day informal summit in the Chinese city of Wuhan in late April and a bilateral meeting on the sidelines of the Shanghai Cooperation Organisation Summit in Qingdao, China in June. "It is important to maintain this momentum and for this we should, at our level, regularly review our relationship and give proper instructions whenever required," Modi told Xi in his opening remarks. He told the Chinese leader that their recent meetings have given a new strength to bilateral ties and also provided new opportunities for cooperation. President Xi said that the Chinese side is ready to work with the Indian side to carry forward the fresh impetus of bilateral relations since their informal meeting in Wuhan, China's state-run Xinhua news agency reported. He called on the two sides to strengthen strategic communication, increase mutual trust, promote practical cooperation, as well as cultural and people-to-people exchanges, strengthen dialogue and properly manage differences, it said. Modi said the Johannesburg meeting has provided one more opportunity to them to strengthen their closer developmental partnership. Briefing the reporters about the meeting, Foreign Secretary Vijay Gokhale said the two leaders reaffirmed their readiness to give the necessary direction to their militaries to enhance communication between them and to maintain peace and tranquility in the border areas. "They were satisfied with the efforts being made by the officials of the two sides to strengthen bilateral engagements and to implement some of the understandings and decisions that the two leaders had reached at Wuhan," he said.